Google removed SearchWiki, the feature that allowed you to customize search results by promoting them, removing them or adding comments below search snippets. SearchWiki cluttered search results and the aggregated results from public SearchWiki pages were rarely useful. 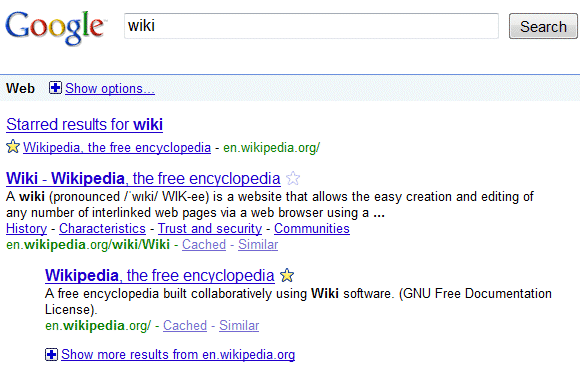 SearchWiki has been replaced with a simple feature that lets you star search results. Click on a star next to a search results and you'll see it in a "starred items" OneBox at the top of the page. Another side effect is that the starred search results are added to Google Bookmarks, so you can quickly find them later. The "starred items" OneBox shows the most relevant bookmarks that match your query and it's the easiest way to search Google Bookmarks. Those who used SearchWiki to remove search results or to add comments won't lose their changes. "If you previously removed a result, it will remain hidden whenever you do the same search in the future. These hidden results will be listed in a "removed results" section at the bottom of the page," explains Google. There's also a SearchWiki page that lists all your notes. Even if I didn't like SearchWiki at the beginning, I ended up using this feature a lot. Adding web pages to search results pages and improving the snippets with custom annotations were a great way to refind web pages. What would have been really useful is for Google to use the search wiki data for other searches - rank favorite sites higher and drop thumbed-down ones to the last page. It might have cut down on the spam. It suprised me, I just saw it. It is meaningless, to me, but may be helpful to others ? Let's give it a chance, Google means well. Maybe others will like it better ? Google Bookmarks and Chrome Bookmarks in Google Docs are two separate entities? How does Google expect to maintain two sets of bookmarks? Well, you can unstar a web page, but that doesn't remove it from Google's search results. Google brought back SearchWiki I'm still using it, it works fine and is exactly like before, there's no starring websites or anything it seems to be just fine. I did notice however, they added the ability to disable Search Wiki in the Search Settings. I can see that starred results will be useful for many users. However, I often use Google searches in order to watch my site ranking (franklludwig.com) on Google, especially in relation to infringing webpages (the links to which Google refuses to remove). Is there a way to turned starred results off? I just found the answer to my previous question: in order to see the unstarred results you simply have to sign out. How does one re-enamble searchwiki? I never starred any of my search items under my name yet one of my pieces is starred. How did that happen? I thought the person could only star their own entries. Is the star like a "like" comment or a form of status from other viewers? No, starring results = bookmarking web pages using Google Bookmarks. Can anyone say is it possible to view my starred wep pages, or is it appearing only when I searching something.